Comrade Stalin lives for our pleasure..."
Official name "Song about Stalin"
Music: M. Blanter Lyrics: A. Surkov 1949. Singer: Aleksey Korolyov, khor i orkestr p/r. V. Knushevitskogo Performed in 1949г. "Chut sedoy, kak serebryaniy topol on stoit prinimaya parad. Skolko stoil emu Sevastopol? Skolko stoil emu Stalingrad?" Music: A.Vertinskiy Lyrics: A.Vertinskiy 1945. Singer: A.Vertinskiy Performed in 1945г. 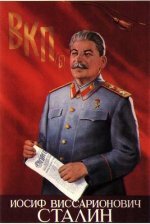 "Long live beloved Stalin, long live dear Stalin..."
Music: Boris Terentev Lyrics: Lev Oshanin 1948. Singer: V.Bunchikov i V.Nechaev Performed in 1948г. "so many do s Stalin have to think about..."
A volklore Song about Stalin,one of the foolest songs on this site. Music: Anatoliy Novikov Lyrics: Sergey Alimov 1949. Singer: Georgiy Vinogradov. Performed in 1951г.